That was the moment when the photo capacities of my little phone definitely met their limits but one thing after another. 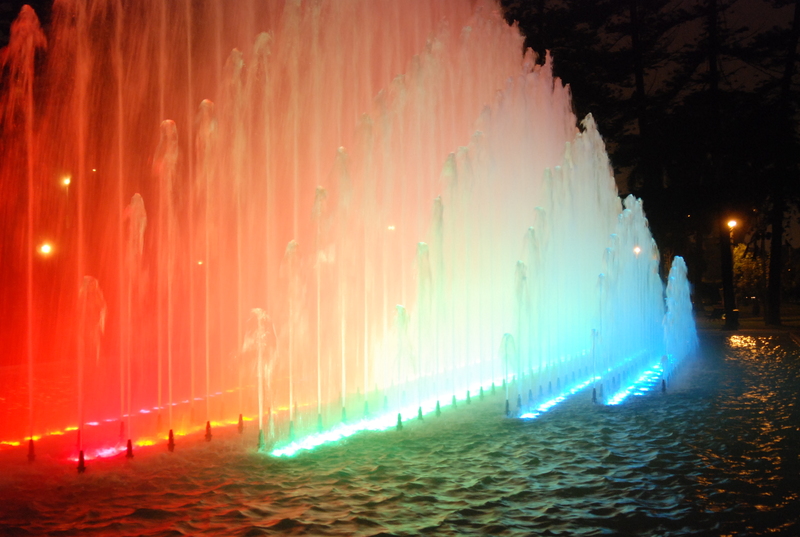 The Parque de las aguas was yet another Times tip of what to do in Lima and again, 100 points. The Parque is halfway between the coast and the historic city centre and can be easily reached by taking one of the mini buses that run all along Avenida Arequipa. Just like the taxis, they might not be entirely safe but the biggest threat emanating from them is the way of driving. While the park itself is old, the water circuits are only from 2007 and they are absolutely beautiful. As I wanted to see the park during the day and at night, I got there around 5 in the afternoon to stroll around for a while and then enjoy the nocturne sight. After spending some 30 frustrating minutes trying to capture at least some of the beautifully lit fountains, I simply decided to enjoy the view. This entry was posted in La puce enchantée and tagged Lima, Peru, visits. Bookmark the permalink.